The English word trumpery means worthless nonsense, something that is showy and deceitful at the same time. Trumpery can occur in text, verbally, or visually. This non-partisan talk focuses on the visual, examining misleading charts, graphs, and data maps designed by individuals and organizations from across the political spectrum. With facts and truth increasingly under assault, many interest groups have enlisted data visualization to support all manner of spin. Because digital images and graphics are inherently sharable and can quickly amplify messages, sifting through the visual information and misinformation is more critical than ever, and creating effective data visualizations without misleading viewers is an important skill for journalistsone that is within your reach, regardless of your background or budget. Alberto Cairo is the Knight Chair in Visual Journalism at the University of Miami. Hes also the director of the visualization program at UMs Center for Computational Science. 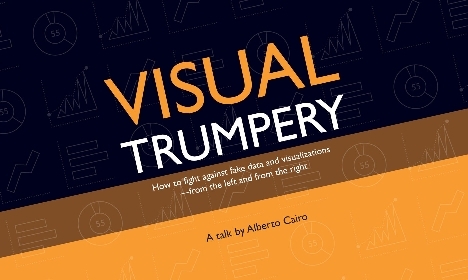 Cairo has been a director of infographics and multimedia at news publications in Spain (El Mundo, 2000-2005) and Brazil (Editora Globo, 2010-2012,) and a professor at the University of North Carolina-Chapel Hill. Besides teaching at UM, he works as a freelancer and permanent consultant for companies like Google and Microsoft. Hes the author of the books The Functional Art: An Introduction to Information Graphics and Visualization (2012) and The Truthful Art: Data, Charts, and Maps for Communication.